Need to sign-up your clinic? Enter the e-mail address you provided during user registration and you will receive an e-mail with instructions for resetting your password. Please contact us if you continue to have difficulty accessing the system. Thank you for checking out CounselEAR.com. We believe that managing your clinic should be simple and stress free. Our innovative systems empower you to integrate your entire office workflow online. With CounselEAR, you can focus on your patients...we'll take care of the rest. CounselEAR, LLC was formed in 2006 with the express purpose of improving patient counseling. We recognized that patients often did not remember important information or follow through with recommendations when given verbal counseling only. As a result, we set out to create a way to quickly generate customized counseling summaries that would significantly enhance patient recall and compliance. Once we perfected the CounselEAR Patient Report, we moved on to making all of your report writing more efficient and effective. With input from clinicians in all work settings, we developed the CounselEAR Professional Report enabling users to rapidly create official audiologic reports. We were extremely gratified by the enthusiastic response that we received from hearing healthcare providers from across the country, but we didn’t rest there. From chart notes to coding wizards, document storage to paperless faxing, Noah compatibility to our Patient Portal, CounselEAR continued to grow based on feedback from our users. In December 2014, we launched our fully-featured, fully-reimagined, fully-amazing CounselEAR Complete OMS. And as one of our customers stated, "CounselEAR puts the OMG in OMS"! We couldn't agree more. 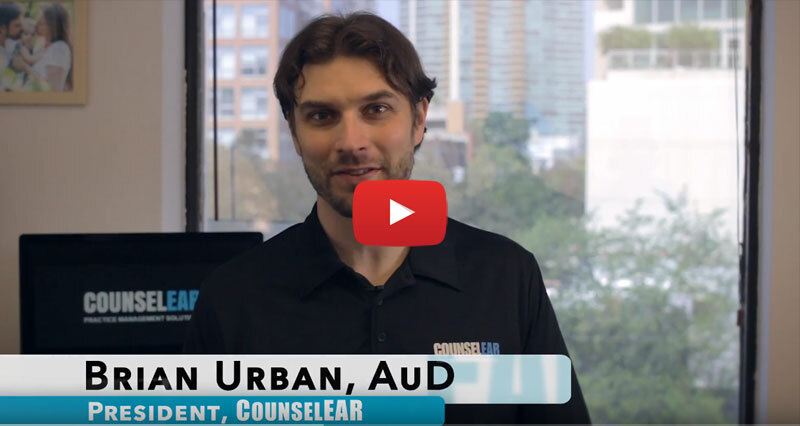 Please check out our 30-Day Free Trial and contact us directly at info@CounselEAR.com or 888.516.4281 if we can help in any way. Thank you again for choosing CounselEAR.